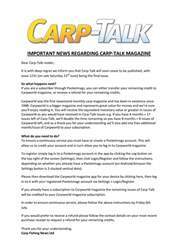 This week’s bumper issue of Carp-Talk (issue 1014) is available to download now! 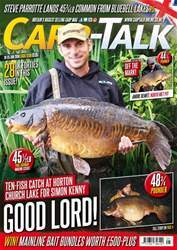 We have got a special report about the success of UK carp farmers, plus big-fish captures from the likes of Elphicks, Wasing Estate, Manor Farm Lake, Bluebell, Cottington and many more. The first heats of the BCAC are reviewed, Iain Macmillan talks open-water fishing, Paul Monkman interviews 2013/14 Fox Mainline Carp Angler of the Year, Dave Smedley, and Geert Ooms relives one of his most successful spring campaigns ever. 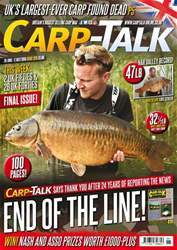 Dave Springall has his own ideas about what constitutes effort in carp fishing, five more venues go under the spotlight in ‘Where to Fish’, Alan Blair recounts the highs and lows of his carping in 2013, and Ali Hamidi talks about his ‘Unconventional Zig Rig’. 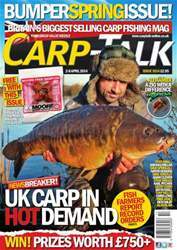 Products from Wychwood, CC Moore, Taska, Fox, Nash and BJF Baits are reviewed in ‘Trade Talk’, Mike Jones recalls a ‘Special Session’, Chris Lowe reveals his top tips for spring, and Tony Welch gets out for some early-spring action. Iain Macmillan, Adam Clewer, Ian Russell, Rich Wilby, Tony Welch, Haydn Hoskins and Karl Pitcher are in the ‘Hot Seat’, and Steve Briggs recounts a February trip to Rainbow Lake in France. We have also got £225 of Gardner goodies in a ‘Know Your Fish’ competition, the Nash Tackle monthly awards winners, and a £500 Taska luggage giveaway.